Waterford FC’s Shane Duggan also got in on the scoring act against Finn Harps. He wants his side to kick on up the table now, starting at UCD on Friday night. Photo: Noel Browne. 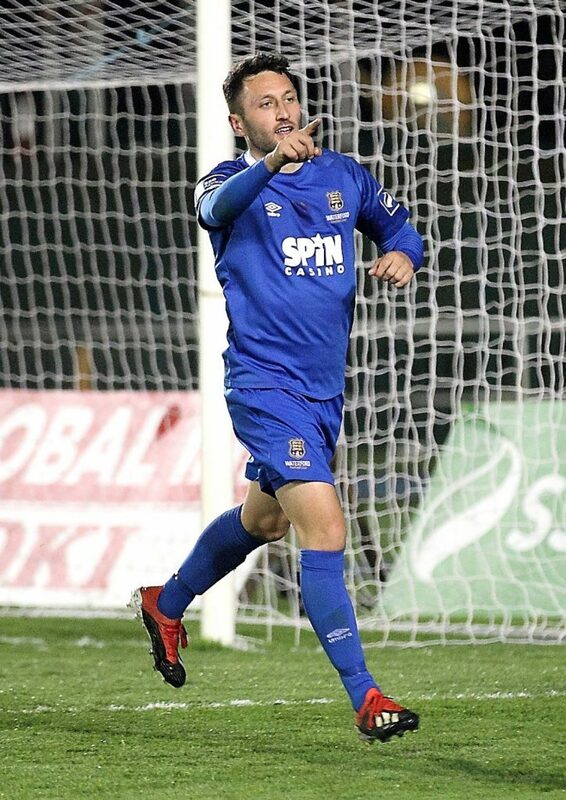 A man of the match performance from Waterford FC midfielder Shane Duggan inspired his side to a vital victory in the SSE Airtricity Premier Division as the former Limerick player was on the scoresheet in a 4-0 win over Finn Harps at the RSC on Friday night. Duggan, who got the call from manager Alan Reynolds to start ahead of Bastien Héry, ran the show in the middle of the park in a starring role, but he is now hoping that the Blues can build on this result in what is a crucial stage of the season. Speaking after the game, Duggan said, “I’m delighted with my performance, but at the end of the day it’s all about the three points. That’s all matters and it was great to get another win under our belts especially here at the RSC. “It’s a great result for us because it was a tough game at the start. I thought that they kept a good shape, battled hard and made life difficult for us. I think once we began to get a foothold into the game, we started to open them up a bit and we were much better. “We knew that we needed to be patient especially the way that they set up. They are a very dogged team and can be hard to break down. We kept the ball moving, but I also felt that we were sloppy at times and we gave stupid balls away. “I was delighted to get on the scoresheet myself. It was a great pull back from Scott Twine the way he picked me out and I was just concentrating on hitting the target. I didn’t think that I connected with the ball that well so thankfully it went in. “We targeted this game tonight that we had to get three points and it’s important that we’ve done that. We need to continue to move up the table and we know that we’ll have stiffer tests in the coming weeks. I suppose we have a tough one next week against UCD, but if the truth be told, we need to be winning those games. “If we have aspirations of being up near the top of the table, we need to be winning that game. There’s a lot of games coming thick and fast. It’s up to us to hit the ground running again and build on tonight’s result. It’s a crucial part of the season and we need to get as many points on the board as we can.